Day DJing a party in Los Angeles in 2005. (Courtesy Kelly Day). 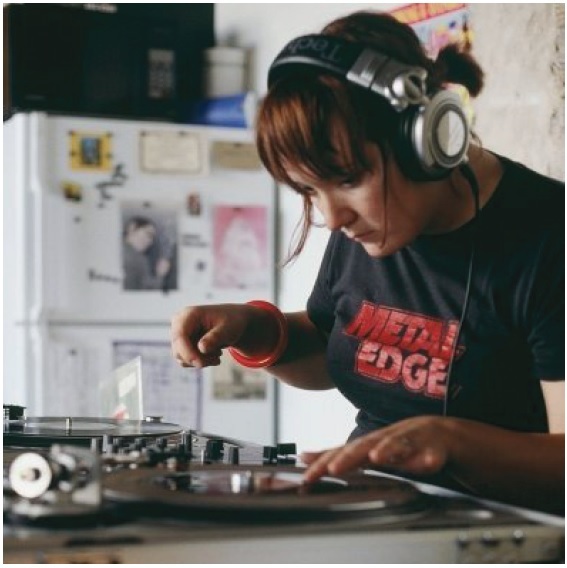 Brighton Heights community organizer Kelly Day is looking for a new way for parents and their kids to get out that will put her massive record collection and experience as a DJ to good use. She is planning a monthly event called Kid City Rockers that will be Pittsburgh’s premier indie dance party for families that Day will DJ. Day came up with the idea when she was pregnant with her first child about three years ago. “I thought, ‘What can I do with my kids that would be aligned with my own interests,’” she explained. Day hopes that Kid City Rockers will be a “quirky family event” that attracts off-beat parents and kids from all over the city to connect and remember their own music roots. Day plans to play music like The Cure, The English Beat Cyndi Lauper, The Pixies and others from her record collection of over 3000 vinyls that she’s collected over the past 20 years. Though Day plans to be mindful of the language used and will play largely upbeat songs. Day was a DJ on WPTS in the early ’90s for four years, DJed at bars in Los Angeles and is alum of the JD Scratch Academy. Though Day has yet to secure a location, she plans to have the parties on the Northside, and hopes they will draw families from other parts of the city. She expects that it will be about $5 per adult, and that kids will get in free. A portion of any proceeds from the event would go to a deserving arts nonprofit that works with youth.